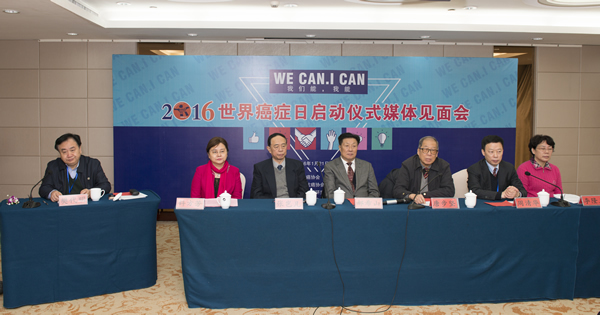 The launching ceremony of 2016 World Cancer Day was successfully held in Nanchang, Jiangxi Province on Jan 21st , 2016, which was organized by Chinese Anti-Cancer Association(CACA), sponsored by Jiangxi Province Anti-Cancer Association, Jiangxi Province Cancer Hospital, Jiangxi Province Cancer Research Institution, and Jiangxi Province Cancer Center, and co-sponsored by Jiangxi Province Broadcasting and Television Station Economic Channel. Approximately 40 press media, over 600 people participated in the ceremony. World Cancer Day is initiated by Union for International Cancer Control (UICC) since 2008 and takes place every year on 4 February. The theme of 2016 WCD is “We can, I can”, which aims at saving millions of preventable deaths each year by raising awareness and education about cancer, and pressing governments and individuals across the world to take action against the disease. 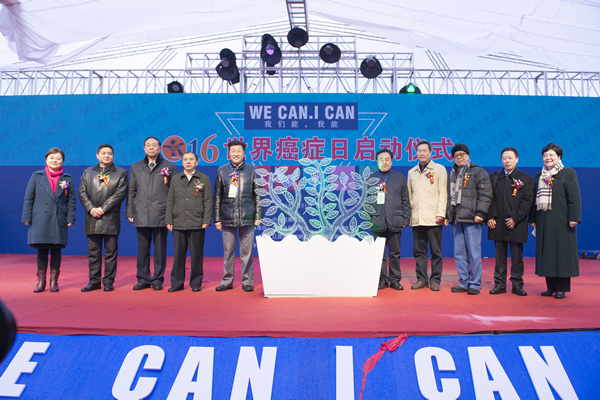 Dr. Xishan Hao, the President of CACA, Dr. Daiming Fan, the Vice-President of CACA, Dr. Fangfang Dou, the President of Jiangxi Province Anti-Cancer Association, and other relevant leaders participated in launching ceremony. Dr. Bernhard Schwartlander, WHO Representative in China, sent a congratulations video to the ceremony. Dr. Schwartlander mentioned “cancer is a leading cause of death �C and becoming ever more so, as the impact of the high prevalence of risk factors like smoking becomes increasingly felt. Tragically, many cancer deaths are premature �C that is, people dying too young, before their time. This has devastating consequences. For the people who die and their families, but also for the broader society with a significant economy impact”. Meanwhile, he emphasized that “World Cancer Day is an opportunity to reflect on successes that we have collectively achieved to date in strengthening cancer prevention and treatment in China. It is also an opportunity to focus our efforts on where we can do better �C for instance, in doing more to prevent cancer where it is possible to do so … for example, by reducing very high smoking rates among men in China �C which could save many millions of lives each and every year”. At last, he affirmed that why organizations like the Chinese Anti-Cancer Association are so special and so important, both in pushing for more to be done to prevent cancer …. and for those cancer cases that cannot be prevented, pushing for better cancer diagnosis and early intervention, treatment and support services �C to ensure we reach everyone in need. Dr. Xishan Hao stated that cancer has not been a pure health problem but it also influences global social and economic development. Comparing with other developed countries, China still faces challenge on cancer control, such as imbalance distribution of public health resources in different geographical parts, and relevant lower skills of treatment of professional doctors. Therefore, we still need to work hard to promote cancer control in China. CACA, as the non-government organization, represents the voices from civil society in China. We do hope we work together with government sectors, schools and institutions, and all social forces to disseminate positive ways of cancer prevention and treatment, so as to providing good services to cancer patients and improving the life quality of all people. After the launching ceremony, the press conference and the lectures about cancer prevention and treatment, free physical examination and psychological consultant, and art performance were held respectively.